It was a beautiful, calm day on the lake as the dad readied the boat to take his son on the ride of his life. The son jumped out of the boat and swam excitedly to the tube that was tethered to the boat with a strong rope. 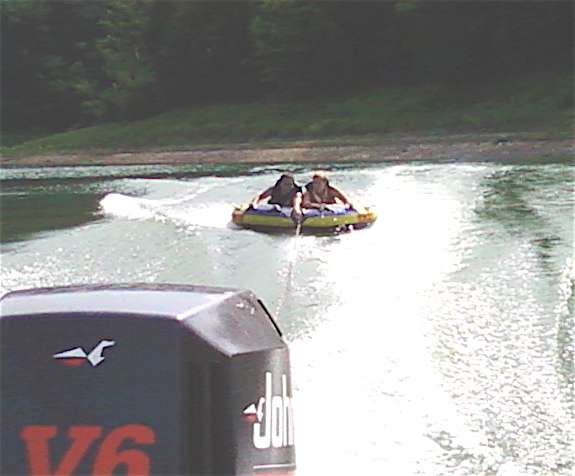 With his life jacket secured, he mounted the tube. Just before the dad readied the boat for take off, he yelled to the son, "Hold on!" The son did as his father suggested because he knew that the ride could get rough. He knew he would be safer if he was holding on tightly to the handles mounted on the tube. He knew he could trust his dad's advice. The apostle Paul spoke to his "beloved son" in the faith, Timothy. He also told him to "hold on." He knew Timothy would be going on the ride of his life as he faced the challenges of teaching a young church how to live for Christ. Paul had invested so much in Timothy to help him become the leader he was. Now, Timothy had to decided whether he was going to heed Paul's advice, which we know he did. In this passage we see that Paul was so confident in what he had modeled to Timothy that he could say, "hold on to the pattern of sound teaching you heard from me." I pray that, as you invest in the lives of those you are responsible for teaching, you will have the confidence of Paul, to say to them, "hold on to the pattern of sound teaching you have seen in me." Better yet, I pray they will have such confidence in what they have seen that they will hold on!